After Christopher Nolan broke out into the mainstream following his phenomenal success with Memento, many speculated as to what his next project would be but few predicted that he would tackle a remake of a foreign film. Early guesswork wondered if Nolan was showing signs of playing it safe or perhaps cold feet over getting too much too soon. 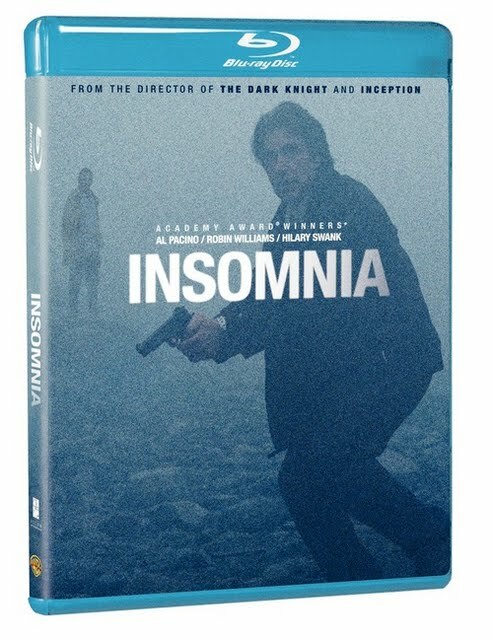 However, while Insomnia doesn't compare intellectually to his dazzling earlier work in both the little seen Following and his masterpiece Memento, the result of his post indie smash was a solidly constructed police procedural thriller with a riveting undercurrent of psychological intrigue. Likewise, it's one that grows far more fascinating on a second viewing when you become eerily aware of the number of parallels being drawn between our conflicted detective and the prime suspect. And despite a sometimes odd tendency to insert various regional accents into some of his line readings as an LAPD veteran, coming across as though he were auditioning for Boyz 'n the Hood during one sentence and then Gone With the Wind a moment later, Al Pacino is otherwise superb as wearied Detective Will Dormer. Loaned out along with his partner Hap Eckhart (Martin Donovan) to take point on an investigation into the brutal beating death of a seventeen year old female high school student, the pair find themselves in the Halibut Fishing Capitol of the World – Nightmute, Alaska – where they're welcomed by an overly eager Detective Ellie Burr (Hilary Swank). Dubbed “Nancy Drew” by her colleagues, Burr, who researched all of Dormer's greatest hits during her time at the academy, is initially unsure whether she should be taking notes on Dormer's words of wisdom or paying closer attention to her own report when they set a trap for the suspect which he can't refuse and then lose one of the officers during a tense foot-chase turned shootout in the fog. Nolan it seems is equally skilled at directing action which would ultimately pay off when Nolan became Generation Y's version of X's Quentin Tarantino with the fanboy favorites Batman Begins and The Dark Knight as he is at tackling conversation heavy sequences. And sure enough the movie gets extremely interesting as we discover not only who our villain is when Robin Williams phones Dormer out of the blue but also when we ascertain that Dormer may not be as squeaky clean as Burr believes due to a heated internal affairs investigation back home and an accident (or is it?) on her own soil. Unable to sleep due to the perpetually sunny season that prevents Nightmute's nights from ever being muted into darkness, Dormer struggles with his own existential dilemma as well as his desire to do the job and close the case. Par for the course, American remakes that remain largely faithful to the foreign source material are exceptionally tricky to judge especially when, as is the case for this reviewer, one has seen and genuinely admired the far more unforgivingly gritty 1997 Norwegian Neo-Noir original. And while I still prefer what actor Stellan Skarsgård did with the detective role in the first incarnation of Insomnia, Nolan's film offers his leads – particularly Williams (creeping you out just as much as One Hour Photo)-- a wonderful opportunity to really explore the various dimensions of their character's personality as the movie takes you in uncomfortable terrain in linking up the main cop with the crook. Brilliantly lensed by cinematogapher Wally Pfister who brings a moody atmospheric quality to the film that's best displayed in the unforgettable fog chase sequence, while Insomnia, which was produced by Steven Soderbergh and George Clooney, won't go down as Christopher Nolan's greatest film, it's well worth tracking down. Filled with extra features, the Blu-ray transfer of the movie looks and sounds as unnerving as it did back when I caught it in the theatre in 2002 but more importantly, watching it again for a closer look at home ensures you the opportunity to truly investigate the type of intelligent, multifaceted layers on display that contemporary cops as Batman style superhero pictures are missing today.